Billions and billions of bacteria lurk in the humble kitchen sponge. Something overflowing with bacteria is lurking in your home, right by your kitchen sink. There it is: the dish sponge. A study published recently in Scientific Reports showed 362 species of bacteria lurking in kitchen sponges—with 82 billion bacteria packed in a cubic inch. "That's the same density of bacteria you can find in human stool samples," Markus Egert, a microbiologist at the University of Furtwangen in Germany, told the New York Times. "There are probably no other places on earth with such high bacterial densities." Some of the bacteria they found were scary, but some were just stinky. One of the microbes, Moraxella osloensis, can cause infections in people with weak immune systems, but is perhaps better known for making laundry, and your sponge, smell. Think you can just wash that all away? Nope. 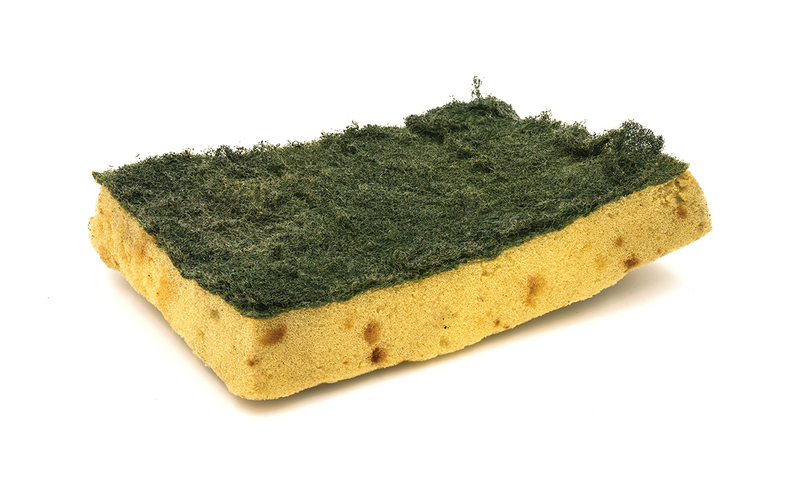 Trying to clean your sponge by microwaving, boiling or otherwise sanitizing it showed about a 60% reduction of bacteria in the short term, but in the long term only served to make the sponge grimier. This could be because pathogen-related bacteria are more resistant to cleaning and rapidly recolonize the areas abandoned by their evicted kin. But don't be alarmed. "You should not become hysteric and afraid of your kitchen sponge now," Egert told the Times. "But if you're already ill or have ill people at home, you should be more careful." The solution? Replace the sponge every week . . . or maybe just skip it altogether.